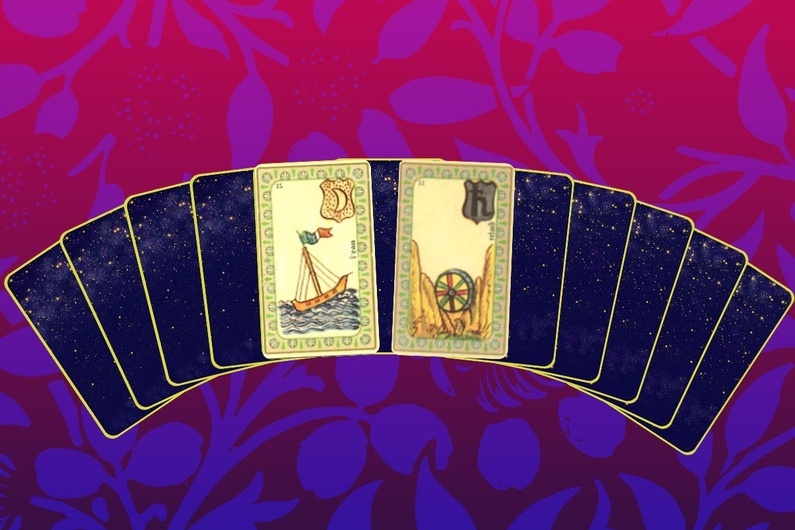 Tarot cards have been around for centuries in Europe and are still largely popular, even when it comes to the continent's younger population. Modern adaptations hint that we are still somewhat dependent on their soothsaying. But what is it like to have your fortune read, and is there any truth in it? It’s raining in Montmartre. The atmosphere of the belle epoque, artists and fortune-tellers still lingers in the air. I tread carefully, trying to clear my mind of all expectations. Today I’m going to visit a clairvoyant who will dictate my fortune through a set of cards. Cartomancy appeared in Europe briefly after playing cards were introduced, in the 14th century. 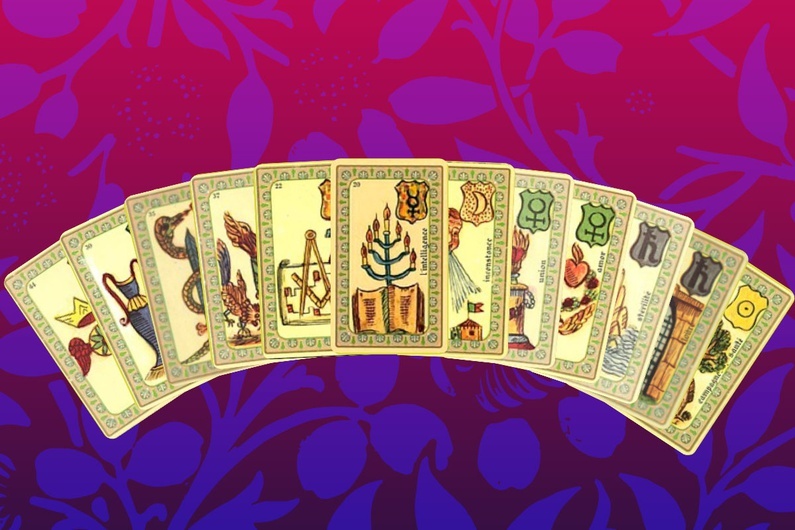 The phenomenon spread throughout the continent like wildfire, with the traditional Tarot cards like the Tarot de Marseille serving as a reference point. At the bottom of the high-rise apartment building, I type in the five-digit door code and wait for Lara to answer. Her voice is crackly and barely audible. “Take the elevator to the 6th floor, and my apartment is on the left.” She buzzes me in and I walk swiftly towards the lift. As the elevator door opens, so does her front door. Fate, or destiny? Time seems to stop, and I’m greeted with a half-smile. The apartment boasts large windows, and a modest and cosy decoration scheme with warm colours. I walk into the living room and set my bag down, peering out onto the balcony to get my bearings. In the distance I see the Sacré-Cœur, perched on the top of the hill like a beacon of divinity. Lara brings me coffee, and unpacks a small wooden box in which she keeps her pastime. “I’m going to smoke. Do you smoke? For this type of work, it helps.” I giggle at the absurdity of the situation. Taking a seat on a picnic bench that borders a simple wooden table, I am immediately offered a more comfortable chair. With ease, we start to talk about the cards. She takes out several decks, explaining that some belonged to her great-grandmother and some to her. “I have some other cards that belong to her, but I don’t use them for readings. They are too loaded with energy.” Lara learned to read cards from her great-grandmother, who had integrated this in their family life. Since a young age, she recalls playing outside while her great-grandmother would be seated around the dining table with her aunt and mother, drawing one card after another. Her great-grandmother had recognised the ‘gift’ of clairvoyance in Lara at a young age, and had left her her decks after passing away, when Lara was about 12 years old. “Some of them are archaic; you can’t deliver messages of the future with tools from the past,” she explains, asking me to finger through the deck that we will be using for my first reading. It’s the Belline Oracle Tarot deck. I need to “manipulate” them. In my hands, they are nothing more than small pieces of paper, embellished with drawings that somehow seem familiar. 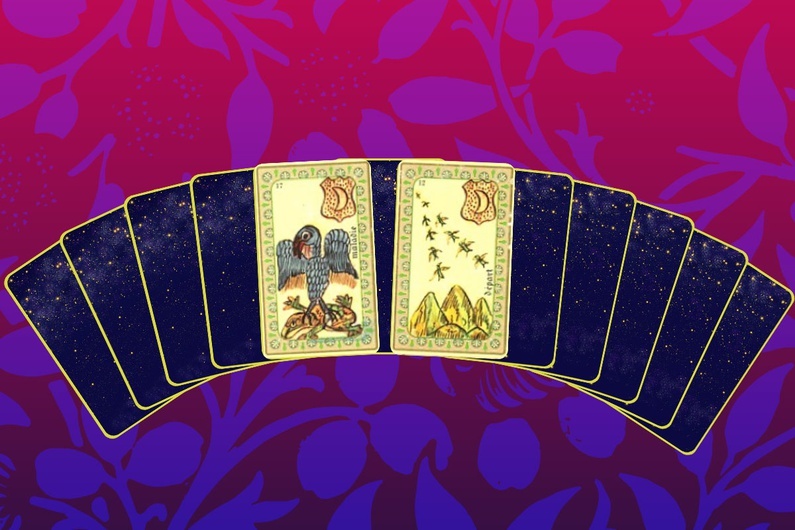 The cards are based on astronomical figures, seven ‘major’ planets group them into themes: the sun, the moon, Mercury, Venus, Mars, Jupiter and Saturn. To begin the session, we start with what she calls a ‘general reading’. A general reading is set up in a chronological sequence, allowing the clairvoyant to define the essential themes occupying their subject's mind. We are strangers to one another, so we will let the cards speak for us. I turn my attention from the Radiohead Hail to the Thief poster that hangs above her head like a halo to the deck of cards. “Cut the deck with your left hand,” she says. My hands shake slightly as I lift half of the deck and set it face down. Lara reaches over and turns the part of the deck that I cut face-up. The card reveals a drawing of a masculine and childish figure, blowing what seems to be wind onto a small house with a flag. It’s a moon card, and has the word “inconsistance” written on it, meaning “fickle” or “inconsistent”. I wait for her interpretation. “There is a person in your life that is versatile and inconsistent. Someone who can’t seem to take a specific position on a certain matter, and is conflicted. Either that, or the card is linked to a process,” Lara begins. This first card is an indication of what the rest of the cards drawn will tell me later on. It should represent a thought that is occupying most of my mental space. As if Lara were telepathic, I try not to think. I don’t want to give her any indication of whether or not there could be any truth in this. I am asked to choose numbers between 1 and 9 in succession, without hesitation. The first ones that come to mind. I choose 2, 4, 8, 6, 3, 7, 1, 5, 8, 1, 2, and 4. Lara stops me there, and lays the rest of the deck out in front of me. She turns the cards that I have chosen face up one by one, starting with those on her left to follow a chronological order. As she gets closer to the end of my fortune, she stops: “These two are very rare to have next to one another.” A silence fills the room like a balloon waiting to pop. Children and sirens wail in the background. She starts by describing the first four cards. “In your very recent past or in the near future, there is (or was) an unexpected event. You will find yourself sat at a table with someone who is jealous or envious of you. It’s more annoying for your ‘enemy’ than it is for you. The elements are in your favour,” Lara says, reassuringly. She continues: “Just because you find yourself faced with this person, it doesn’t mean you will lose your ardor. You have a good energy, and you’re equipped to deal with this.” Her description is vague, and I draw a blank. I can only think of one recent event that fits this description, but it was so insignificant to the point that I forgot about it. Grouping the next two cards together, she moves on to my professional life. “I see that there’s a project that will mobilise your intelligence. With the goal of moving forwards, of progressing. It will be something that interests you deeply, allowing you to develop intellectually.” The fire card that precedes this set acts as a bridge. “The dynamism, the fire that is in you… it’s linked to this project. That’s what the cards say.” I answer with an approving nod. Things are looking up, but that hint of optimism could be applied more generally. It’s the definition of the Barnum effect. We get to the defining card in the draw, that of the ‘inconsistent’ character. Lara hesitates, and stops to ask me a question: “Is there someone with which you have a great love, but who is hesitant to commit?” The words slip out of my mouth without my control. “Yes,” I reply, as if someone else had stolen my tongue. 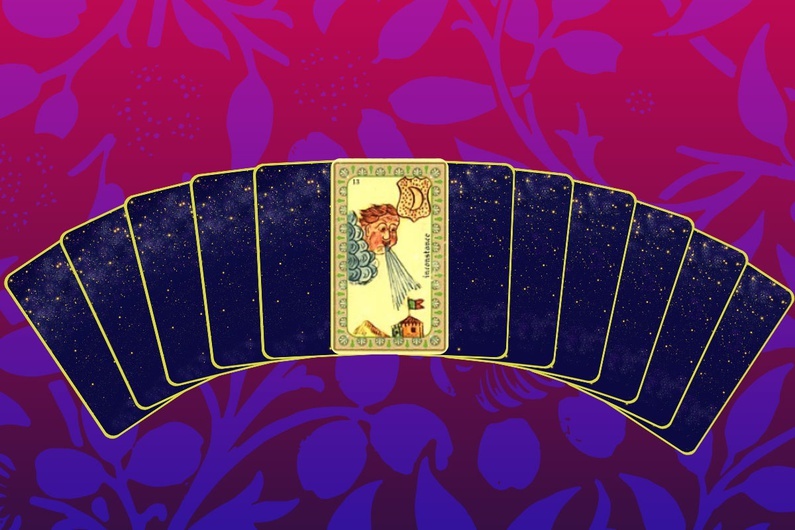 “The core of this inconsistent situation or character is actually a good thing, because there’s this pairing here,” she explains, while she points at the cards ‘union’ and ‘love’. “It’s a big love, but also a big fear in your life. It’s in this specific order because the doubt - the inconsistency - isn’t linked to the love. The doubt is linked to the union. In this sense, the union is almost irrelevant, because the pairing indicates a sort of eternal protection of the love at hand.” Those are reassuring words, but only in that she hit the nail on the head. “This person in your life has a tendency to doubt things, and the hesitation of this union is linked to the person in question,” she concludes. I keep quiet, trying not to lose face. Seeing my reaction, Lara can tell that I’m not entirely convinced. She asks me to pull out two last cards to see whether or not the solution they gave me is sufficient. I pick them out using one hand, making sure I don’t break up the row. “There it is. With regard to the “malaises” this brings you, the only solution is to leave. The cards still insist. When they’ve decided to tell you something, they won’t change subject.” My facial expression goes from doubt to acceptance. I’ve given in. Looking down at my deconstructed fortune, I see a pattern. I have drawn a total of four moon cards. As if to read my thoughts, Lara concludes: “You drew four moon cards. It’s obvious. This ‘lunatic’ person is conflicted in this moment and feels stuck, and in order for you to be capable to reach a ‘union’ - which is a difficult engagement - the best place to be is close to the water. The cards repeated themselves three times.” We’ve exhausted all the options.